The Karvol Vaporiser promotes clear, easy breathing in a plug-in format that is clean and simple to use. 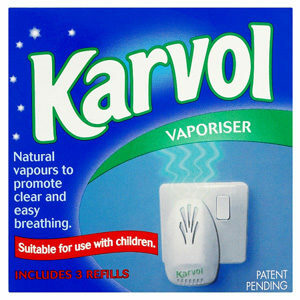 The Karvol Vaporiser Refills promote clear, easy breathing in a plug-in format that is clean and simple to use. Karvol Vapour Rub contains menthol to help easier breathing. It can be used for children from 6 months old.